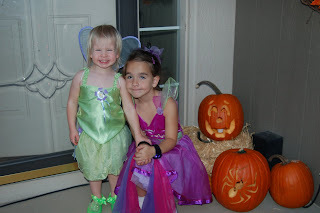 I'm finally getting around to posting pics of the girls from trick or treat night. 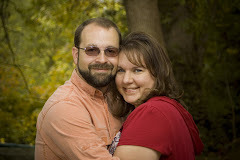 We just recently bought my BIL's digital camera and we have been playing with it, trying to learn how to use it. The pictures below were taken with the new camera. ( I will show you all later what kind it is). We love it but still learning. I'm so bummed that some of these pictures came out blurry. I got Cassie dressed so I can get her picture taken by herself. Just look at her. She is such a ham!! She was saying "Cheese". 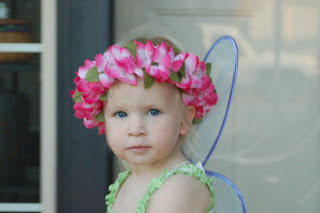 My little fairy angel!! I love this one!! So sweet!! Here they are together. This is the one and only pic I got of them together. Then the tudes came out. 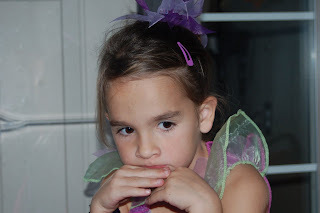 This is Aundrea upset because she could not start trick or treating when she wanted too. But, what a sweet face. I don't even remember what Cassie was crying about. But they finally got happy!! 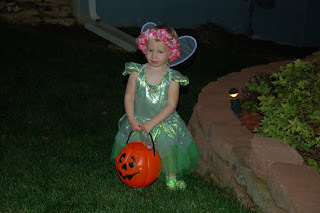 Here is Cassie in her second Tinker bell costume. This is the one she wore the rest of the night. 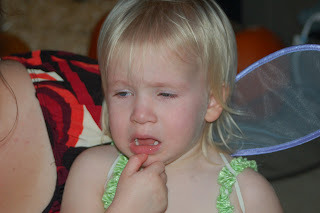 Kevin took them out and I stayed home and pasted out candy. 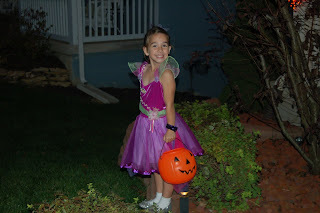 Cassie sounded so cute saying "trick or treat" and moving her hips side to side saying "tinker bell" over and over. Thanks for checking in. Have a great day!! 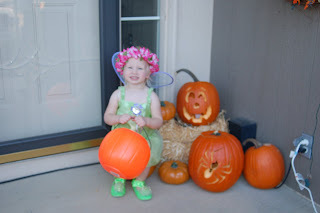 We were so excited to see the "Little Tinker Bells". They are so cute! It just makes us want to get hold of them and love on them. Maybe soon we can! Tell them how both how cute they were and that we miss them. both girls are growing to fast. I can"t wait to see you all. The girls looked so cute. Cassie is your little ham...she loves to take pictures. Thanks for sharing the pictures!